Phew! I made it home in one piece with all my luggage (but that's a story for another day). From your comments, it looks like you enjoyed your selection of period costume drama goodness. Hopefully, you still have enough in you for more costumes! Alas, I didn't get any pictures on Thursday so we're starting on Friday. I'll scour the interweb for Thursday pics or take some outfit shots later, but for now on to Friday! 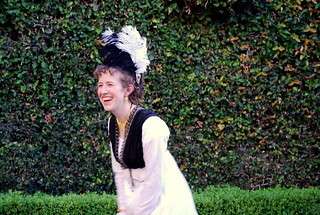 Friday was my Edwardian/Downton Abbey day! 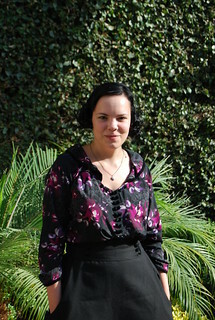 I wore my Edith's black floral blouse with a new skirt. 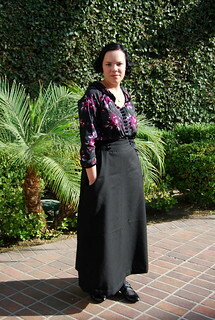 The skirt is Butterick 9682 from 1915 which is available from Past Patterns. It came with a hand drawn copy of the pattern and a photo copy of the original directions (which were pretty sketchy). I had some issues with the waist band-first off, my grading was off and it came out too big, and second, the closures were really complicated-6 hooks and eyes and two snaps in 3 separate closures. But Edwardian closures are supposed to be complicated and it works so I'm cool with that. 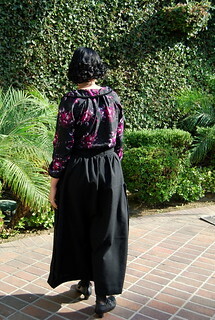 It's super fun to wear and has POCKETS!! Plus the whole thing has almost 70 buttons on it but, thankfully, they are all decorative. I purchased them from Yummy Treasures on etsy. 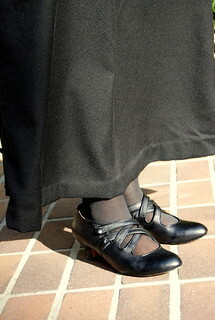 And I wore my Astorias from American Duchess. I wore them all day and they were super comfy. I also got to meet Lauren R., American Duchess while I was wearing these! Friday evening was the ice cream social so we all headed back to our rooms for a quick costume change. 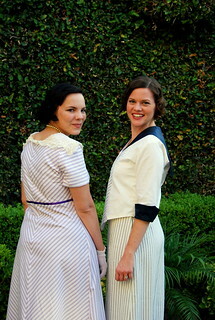 I wore my Lady Mary's Garden Party dress with faux pearls, vintage crochet gloves and my Astorias again. 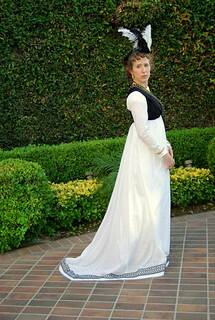 The lovely Ginger of Scene in the Past in a fabulous regency dress. 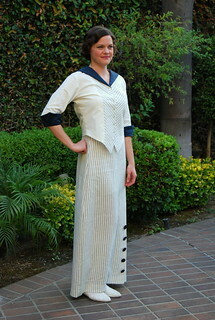 Beth of V is for Vintage in a darling Edwardian nautical ensemble. 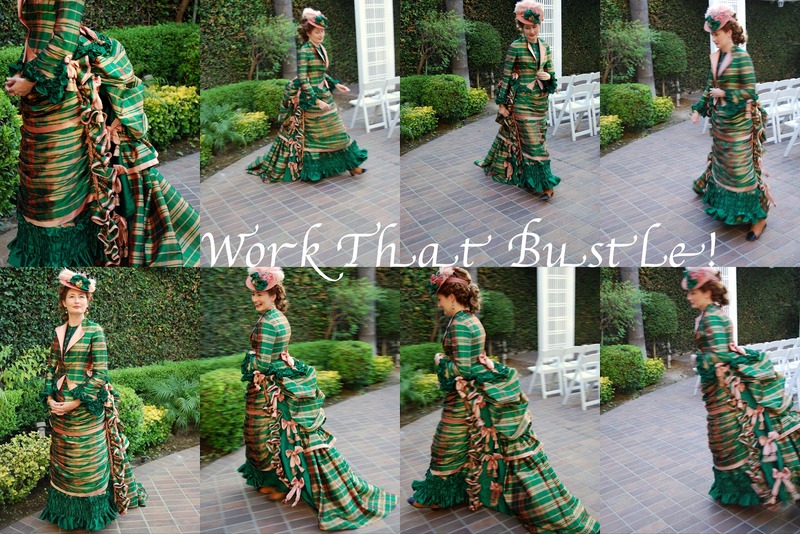 Lauren M. of Wearing History in an amazing plaid bustle dress. Check out her plaid matching skills! And it wouldn't be Costume College without some silliness. If you've ever wondered how to get your train to look great for a picture, this is how you do it. I was bad and didn't actually take any pictures at the Ice Cream Social or the market place grand opening which was right afterwords but here's one of me I found on Flickr. How neat! Everything looks so lovely! 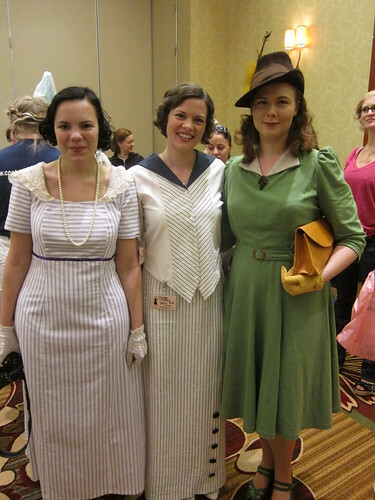 I think your Lady Edith look is my fave! 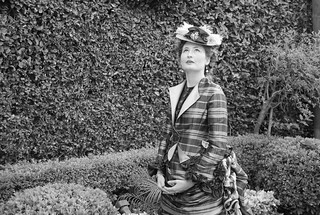 Period costume heaven if ever there was! 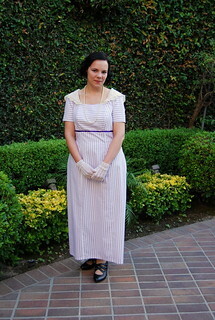 I adore your Edwardian look, and really enjoyed seeing everyone else's great outfits, too.